﻿All Orem High Juniors will have the opportunity to take the ACT in March 2018. This test will be administered at the school during school hours. We encourage our students to take advantage of this free test and to retake the test as many times as the student is able. Studies show that the more often a student takes the test, the higher the score. Below is a link to the registration sight and dates, for this school year, that the ACT will be available for students to register for and take for a fee (the ACT test alone costs $46.00 without late fees). Family receives low-income public assistance or lives in federal subsidized housing. 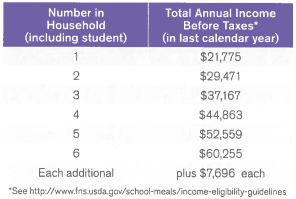 Family's total annual income is at or below the USDA levels for free and reduced-price lunches listed here. ​If you order and pay for a Test Information Release (TIR) during the registration process and test at a national test center on a national test date that offers this service, you will receive a copy of the multiple-choice test questions used to determine your score, a list of your answers, and the answer key. (If you took the writing test, you will also receive a copy of the writing prompt, the scoring rubric, and the scores assigned to your essay by two readers.) Information about ordering a photocopy of your answer document (including your essay if you took the writing test) for an additional fee will be included with your materials. Most schools accept scores from either, but you may be better suited to one than the other. For instance, students who excel in math and science may prefer the ACT, which has more math (including Trigonometry) than the SAT, and a section on science reading that the SAT lacks. If you have an impressive vocabulary, the SAT may be a better choice. The ACT stresses grammar more than specific words. The ACT may be better for students who consistently work hard at school because it reflects the high school curriculum and relies less on reasoning. There is good evidence that teens that test well on the SAT also usually do well on the ACT, but not vice versa. Do a test run online and gauge the scores and comfort level, then decide.